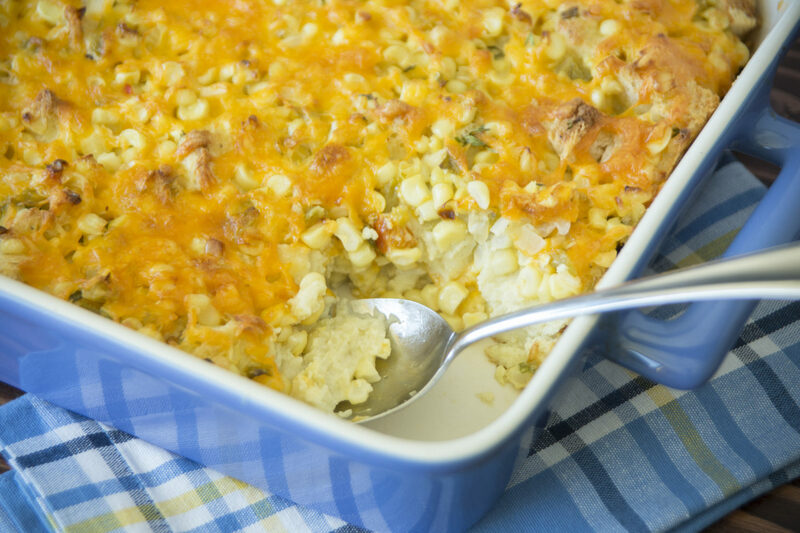 Tantalize your taste buds with this hearty and delicious Fresh Corn and Cheddar bake. Perfect for breakfast, brunch or a great addition to your next meal. Enjoy! Remove crusts from baked loaf, cut into 3/4-inch cubes and set aside. Melt butter in a large skillet over medium high heat. Add corn and onion and cook, stirring often, for about four minutes. Remove from heat and add green chilies. In a large bowl, whisk together the eggs, half and half, mustard, thyme, salt and pepper. Stir in the corn, onion mixture. Place half of the bread cubes evenly in the bottom of a sprayed 2 1/2 quart casserole dish or 9×13-inch baking dish. Pour in half of the creamy corn mixture. Sprinkle with half of the cheddar cheese. Repeat with the remaining bread, creamy corn mixture and cheese. Bake at 350º F 35-45 minutes.